* Challenging and provocative book * Shows how management accounting techniques can be integrated into the strategic decision making process * Extensive use of practical examples from a variety of contexts.An introduction to business strategy for management accountants, financial accountants or managers with an accounting orientation. The book places management accounting clearly within the context of strategic management of the business. 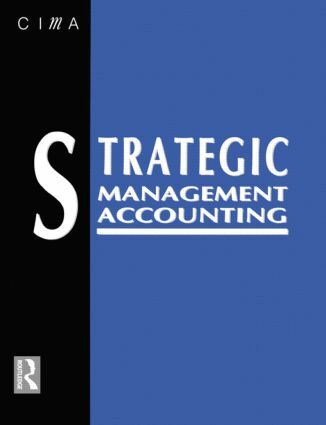 Offers qualified accountants a sound introduction to strategic management, and with practical examples and mini-cases provided throughout, this book is comprehensive yet concise. Keith Ward addresses strategic management accounting as a continuous process of analysis, planning and control. Management accounting is about supplying the right information to the right people at the right time, and this can only be expressed in the context of the business strategy and strategic plan. The implementation of appropriate management accounting systems to complement different strategies is discussed in detail. Applications and examples include multinational organizations, non-profit organizations and varying organizational structures. Finally the author covers methods of using management accounting for strategic advantage. Preface; Linking strategy and management accounting - Introduction and overview; Strategic planning; Management accounting in the context of strategic change; Accounting for competitive strategy - Segment profitability: an overview; Competitor accounting; Customer account profitability; Product profitability analysis; Corporate strategies: the role of strategic management accounting - The relevance of organization structure; Single focus businesses; Vertically integrated businesses; Conglomerates; Multinationals and global companies; Non-profit organizations; Changing strategies as businesses develop - Common problems of control; Launch strategies; Accounting for growth businesses; Strategic management accounting on reaching maturity; Coping with old age and decline; Information requirements for strategic management accounting - Designing strategic management accounting systems; Operating strategic management accounting systems; Index.